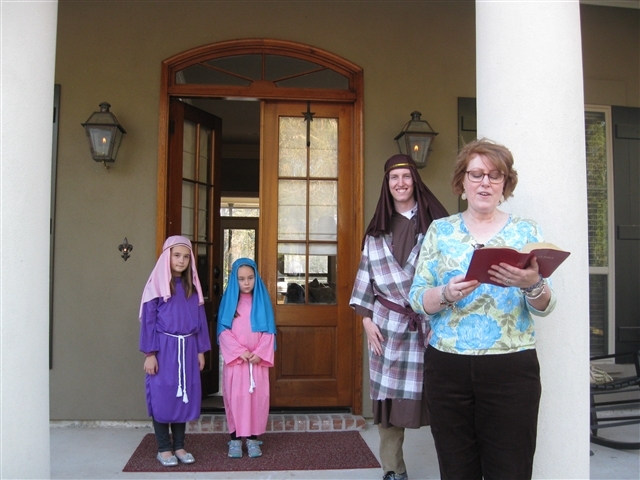 St. Andrew’s United Methodist Church in Baton Rouge recently celebrated the tradition of Las Posadas, starting at the church sanctuary on Monitor Avenue and traveling to houses in the surrounding neighborhood. Las Posadas is usually a nine-day celebration with origins in Spain, now celebrated chiefly in Mexico, Guatemala and portions of the Southwestern United States. Participants in the event held at St. Andrew’s UMC met at the church to carpool to the first “inn,” then walked behind Mary and Joseph, reliving their Biblical journey as they searched for shelter in Bethlehem before the birth of Jesus. Christmas carols, children’s activities and refreshments for all ages were enjoyed back at the church. 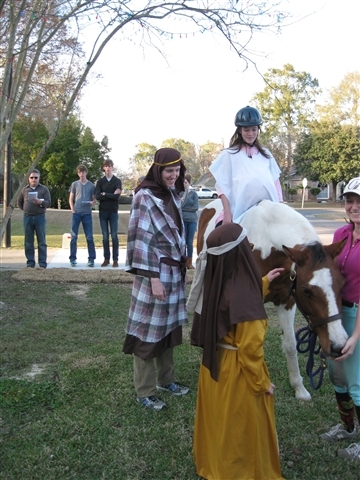 Pictured above is Sara Johnston as "Mary" riding the "donkey" (a.k.a. India, the horse.) Rev. Juliet Spencer, also shown, led the Las Posadas.